The transfer window might be closed in most major European leagues, but players are still allowed to move within the Russian Football Premier League until February 24. Russian national team player Oleg Shatov has now used the extended window in Russian football to push through a loan move from Zenit to Krasnodar. On the verge of becoming one of the most sought-after prospects of the Russian game just a couple years ago, Shatov has fallen out of favour with Zenit head coach Roberto Mancini. Used in 13 RFPL games, in which he played just 617 minutes, Shatov scored five assists. In fact, the midfielder, who can play on both wings as well as a holding midfielder started every game until matchday 6. With Zenit signing Matías Kranevitter and Emiliano Rigoni in the second half of August Shatov saw his playing time severely reduced. Even young star Kirill Kaplenko was used ahead of the midfielder in Zenit’s last game before the winter break—a 0-0 draw against Akhmat Grozny. The question now is where has it all gone wrong for Shatov? During the 2015-16 season, Oleg Shatov still managed eight goals and nine assists. Playing under André Villas-Boas, he was used in a more offensive role playing on either wing in a three-man attack. He continued in that position last season, where he missed some games with an operation, but still amazed two goals and seven assists in 18 games, under head coach Mircea Lucescu. It was under Villas-Boas, however, that Shatov became the sort of player that was scouted by international clubs. Borussia Dortmund, which are very active when it comes to scouting the post-Soviet space, were one of the clubs Shatov was linked with during that period. Following his injury last season, however, the inconsistent performances began, and Lucescu left him out for the last two games of the season against Krasnodar and Lokomotiv Moscow. With an inconsistent season under his belt, Shatov was then left out of Russia’s 2017 FIFA Confederations Cup squad. This should have been a warning sign for Shatov that he needed to buckle down and improve his performances if he wants to be part of the Sbornaya that will represent the host nation on the biggest stage next summer. Hence, with the prospect of very little playing time at Zenit, the time had come to look for a move to another club. Shatov’s fall off form, however, meant that European clubs showed very little interest in bringing in the midfielder. The big Russian clubs that are still competing in international competitions in the meantime did shy away from the costs that came associated with a transfer. 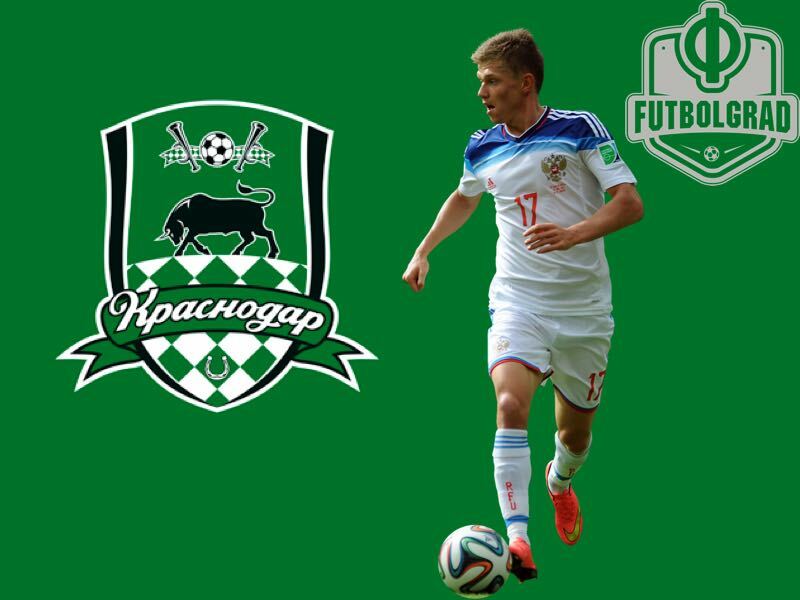 At the end of the day, the only option left were Krasnodar, who signed the midfielder on a loan deal. The South Russian club are no longer competing in the Europa League and therefore were not worried about bringing a player after the squad lists for European competitions were finalised. Also with the club sitting in fourth place just one point behind second-placed Zenit and third-placed Spartak Krasnodar still have a realistic chance to clinch one of the three Champions League spots available in the RFPL. Finally, Shatov would fit in well with Igor Shalimov’s 4-2-3-1 system where he could slot in nicely as a holding midfielder, or even better play on the wing behind Fedor Smolov. The partnership with Smolov, who chose not to join West Ham United this winter, might be indeed the biggest reason for Shatov to make this move. Partnering up with the forward that will be the face of the Russian team next summer means that Shatov will be given plenty of opportunities to show Russia’s head coach Stanislav Cherchesov that he needs to be part of the Sbornaya. After all, Cherchesov will try to build his attack centred on Smolov and any player that can show chemistry with the big man up front will be in a prime position to nail down a squad position.